Open-source solar-powered 3D printers could bring 3D printing to remote areas, Professor Joshua Pearce at Michigan Technological University has proposed. One version features an array of solar photovoltaic panels and a stand-alone printer that could be stationed in a sunny schoolyard and print anything from consumer toys to science lab equipment. The second system is smaller and fits in a suitcase, based on a RepRap 3D printer and can thus replicate itself and make parts for larger printers. And it can go almost anywhere. Well-intentioned sustainable development projects sometimes fail because they don’t fully understand the needs of the community, he said. A 3D printer can help overcome that problem as it makes open-source appropriate technology. “It can make whatever people want,” Pearce said. 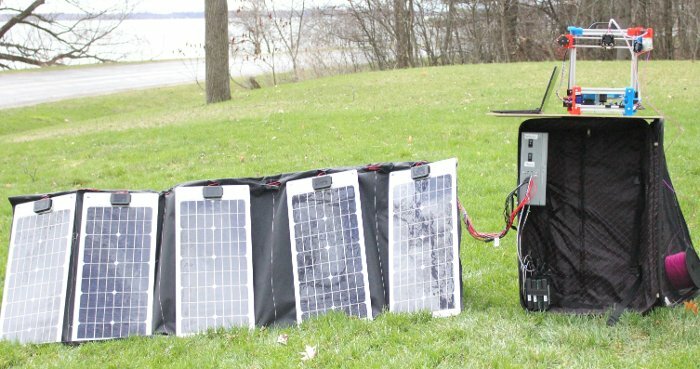 An article describing the work of Pearce and his team, “Mobile Open-source Solar-powered 3D Printers for Distributed Manufacturing in Off-grid Communities,” will be published in the October Issue of Challenges in Sustainability. Manufacturing in areas of the developing world that lack electricity severely restricts the technical sophistication of what is produced. More than a billion people with no access to electricity still have access to some imported higher-technologies; however, these often lack customization and often appropriateness for their community. Open source appropriate tech­nology (OSAT) can over­come this challenge, but one of the key impediments to the more rapid development and distri­bution of OSAT is the lack of means of production beyond a specific technical complexity. 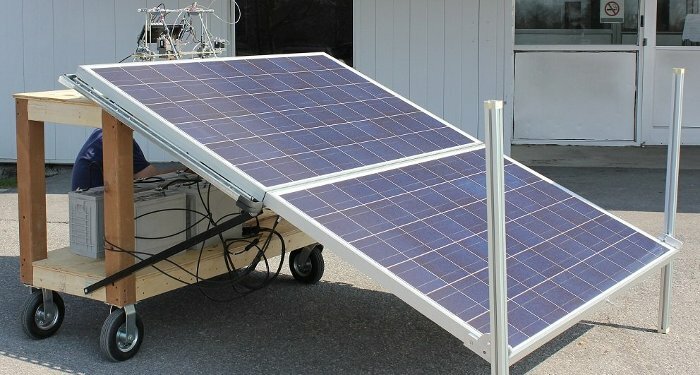 This study designs and demonstrates the technical viability of two open-source mobile digital manufacturing facilities powered with solar photovoltaics, and capable of printing customizable OSAT in any com­munity with access to sunlight. The first, designed for com­munity use, such as in schools or maker­spaces, is semi-mobile and capable of nearly continuous 3-D printing using RepRap technology, while also powering multiple computers. The second design, which can be completely packed into a standard suitcase, allows for specialist travel from community to community to provide the ability to custom manufacture OSAT as needed, anywhere. These designs not only bring the possibility of complex manufacturing and replacement part fabrication to isolated rural communities lacking access to the electric grid, but they also offer the opportunity to leap-frog the entire conventional manufacturing supply chain, while radically reducing both the cost and the environmental impact of products for developing communities.